Medical Biomimetics Market size was valued at USD 23.5 billion in 2017 and is expected to witness growth of over 5.5% CAGR from 2018 to 2024. Growing advancements in nanotechnology will assist global medical biomimetics market growth in the forthcoming years. Nanotechnology possesses potential to illustrate single molecules/cells at very high output and shows dynamic biomimetic behaviour. Such advancements can yield development of personalized medicine. Nanoparticles can exhibit progressive functions including response to stimuli, targeting cell/organ, imaging as well as drug delivery. Such beneficial capabilities along with continuous advancements will positively impact biomimetic market growth in coming years. Expanding geriatric population base will positively influence medical biomimetics business growth. Elderly population is highly susceptible to suffer from cardiovascular diseases, orthopaedic diseases as well as neurological disorders. As per American Heart Association, about 43.7 million Americans aged above 60 years of age suffer from at least one form of cardiovascular disease. Hence, increasing utilization of biomimetics in cardiovascular field will augment the market growth in the forecast period. However, presence of restrictive regulatory scenario may hamper medical biomimetics industry growth in forthcoming years. 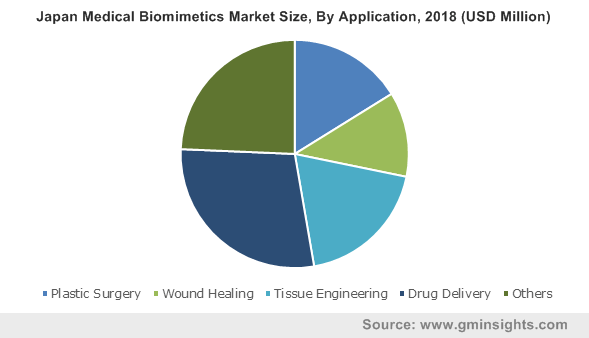 Cardiovascular medical biomimetics product segment accounted USD 8.4 billion in 2017. With assistance of tissue regeneration and biomimetics, several advanced products are being developed to cure cardiac disorders at chronic stages. Such tissues with the help of biomimetic technology improve cardiac function. Thus, increasing prevalence as well as mortalities due to CVD should increase the adoption of medical biomimetics product in upcoming years. Orthopaedic medical biomimetics product segment will progress at 5.8% CAGR throughout the forecast period. Biomimetic bones are designed that imitate natural bone structure that can be used in patients with walking disabilities. Biomimetics has developed novel hip prostheses carrying characteristics similar to contiguous bone that should increase the product demand. With rising road accidents coupled with growing demand for prostheses, orthopaedic product segment growth will spur in the upcoming years. Drug delivery application segment accounted for over USD 6.5 billion market size in 2017 and is estimated to dominate the global medical biomimetics market throughout the projected timeframe. Better performance of vaccines as well as accurate drug delivery of nanocarriers through biomimetic devices will accelerate market growth. For instance, biomimetic drug delivery carrier such as recombinant bacteria are used for vaccine delivery. Such continuous R&D activities along with new product launch will highly impact medical biomimetics market growth. Tissue engineering application segment is poised to grow at 6.0% CAGR during the projected timeframe. Advancements such as biomaterials that imitate natural extracellular matrix for tissue regeneration will stimulate segmental growth. The technique of tissue engineering restores damaged tissues by merging cells from the body with biomimetic materials. Increasing application of biomimetics in organ regeneration will thus impel segmental growth in upcoming years. 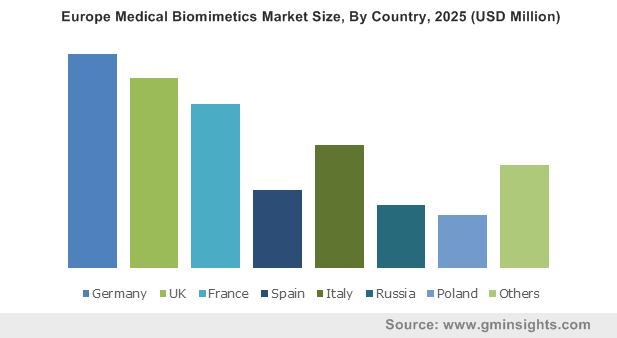 U.S. medical biomimetics market dominated North America industry with over 85% market share in 2017. Growing burden of chronic diseases coupled with aging population will offer lucrative medical biomimetics industry growth potential in coming years. According to CDC, about 6 among 10 adults in the U.S. suffer from chronic diseases. Additionally, increasing adoption of non-invasive cosmetic surgeries should drive the demand for medical biomimetics product. Japan medical biomimetics market held USD 1.0 billion in 2017. High growth is attributable to growing R&D activities, rapid adoption of innovative products and partnerships. For instance, 3B’s Research Group established long-term partnership with universities across Asia. In addition, growing healthcare infrastructure as well as funding in the country will boost Japan medical biomimetics industry growth. 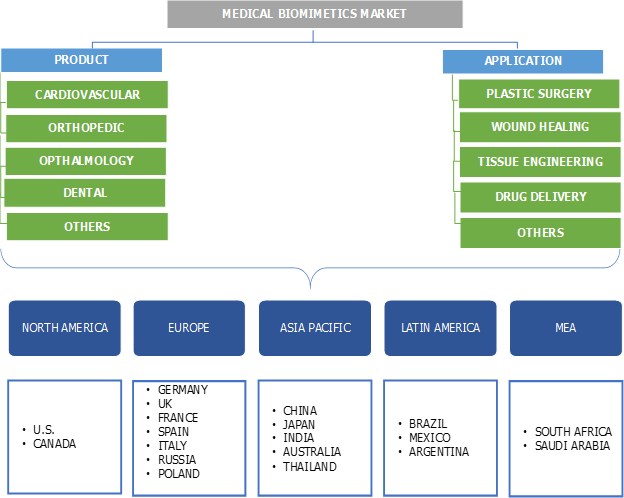 Few of leading market players operating in global medical biomimetics industry are Abbott, Biomimetics Technologies, BioHorizons IPH and Veryan Medical. Companies are adopting growth strategies such as novel product development and introduction along with collaboration to reap profits in the market. Biomimetics Technologies Inc. is focusing on partnerships for development of its skin care products, aimed at fortification of its product base. The history of biomimetics industry can be dated back to the 1900s. The concept of biomimetics was used across various fields such as aircraft, construction, chemical, medicine among many others. Application of biomimetics in medicinal field involved creation of biocompatible medical bandage which was made compatible with human tissue and that allows professionals to monitor status of cardiac disorders. Further, incorporation of nanotechnology played a pivotal role for application in bone structures as well as drug delivery systems. Nanotechnology and drug delivery are emerging fields of biomimetics rendering high demand for products. With continuous innovations in the biomimetics field, tissue engineering and regenerative medicine will offer high medical biomimetics industry growth potential in the foreseeable future.